Occasionally he "likes to dance as if no one is watching" which is ironic as his dancing makes people stare. If you are really unlucky, you may meet him, and whatever you do, don't offer him a drink as he is a very rude and uninteresting person.Chas Watkins was born and raised in England and is a naturalized Australian. His children are all American, which he finds very confusing. He moved to Roatan nine years ago. He has an unused degree in electronics from Hull University in England and has somehow managed to work for many fine and good companies without being fired. To Hold The Sun is an inspirational self-help novel written by Chas Watkins. The narrator is an investigative journalist who has been going through hard times professionally. His carefully laid plans of becoming a prominent journalist have not come to pass, and he'd been wondering how the bills would get paid if some commissions didn't come through soon. He's elated to be called into his editor's office and offered an assignment. The editor, long interested in self-help seminars and conferences, had met Paul Haletine, the subject of the assignment, at a conference. His theories and practices intrigued the editor and so the assignment was created. There would be no remuneration, something which causes the narrator to initially refuse the job, until he learns that Haletine lives on Roatan, an island in the Caribbean famous for its scuba diving. Chas Watkins' inspirational novel is a marvelous story that may also change your life. The reader gets to absorb the narrator's explorations into Haletine's philosophy, and, somehow, learning third-hand as it were through the narrator's experience and responses makes the lessons that much more profound and impressive. I found myself considering each exercise and meditation as Paul coaches his visitor and I feel empowered to make some of those same changes. I also loved reading about Roatan and the accompanying pictures make the island's beauty come to life. I love swimming and snorkeling and will be seeing those clear waters and broad sandy beaches in my mind for some time to come. To Hold the Sun is a beautifully written and stirring inspirational novel, and I highly recommend it. To Hold the Sun by Chas Watkins is the story of a reporter tasked by his editor to write a series of articles about one of the speakers in a conference that he attended. He won’t be paid to write the piece, but at least he’ll get to travel to the beautiful island of Roatan and scuba dive in the place’s stunning reef. His subject is Paul, whom the editor thought is strange because he does handstands. Paul talked in the conference and, despite no one knowing him before the seminar, he got great reviews. This reporter will not only get the best scuba diving experience, he will also learn some of the best advice on how to be happy. To Hold The Sun is the first self-help book I have read that was written in a story-like fashion and I liked it. Chas Watkins’ writing made it easy to understand what he wants to say because it was in a realistic context. His delivery is both unique and effective. The examples are more subjective and personal because the main character is having the experience and then he gets to try Paul’s methods. I liked how Paul explains his philosophies; he goes on long tirades but it wasn’t boring because it was done during a conversation and he was kind of funny. I love that Paul is a skeptic and that everything he tells the reporter has an explanation and a foundation. Everything Paul said is very useful, especially the first method of removing the emotion attached to a memory. I want to try it out. Overall, I think that this book accomplished what it meant to do. To Hold The Sun by Chas Watkins is a self-help book that delivers a very powerful message on happiness and contentment using the story of a journalist, who in the course of doing his work had the opportunity to meet an extra extraordinary man with unique and intriguing views on life and happiness. 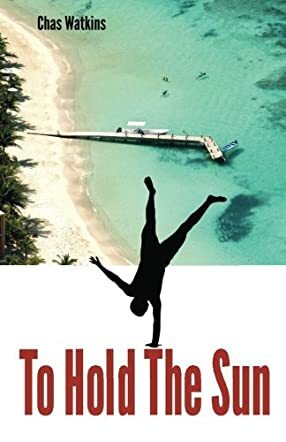 Paul Haletine, resident of the beautiful island of Roatan is a man with a very unique approach to living a happy and fulfilled life and in this book Chas Watkins narrates the brief, but very significant time the journalist spent with with Paul Haletine, trying to understand his bizarre and yet very effective happiness techniques and his general perspective on life. Chas Watkins uses this story to present very interesting ideas on the subjects of faith and spirituality, freewill, change, will power, emotional pain and several other aspects of life with the bottom line being how to achieve contentment and happiness in everyday life. To Hold The Sun is a very unique story that is both inspiring and soothing. To live your life in a way that enables you to have the ultimate control about how you feel about certain things that matter is the only way to achieve absolute happiness. Paul's unique perspective on life and on what is important made me take a minute to evaluate the way I have been looking at my life and in the end, I realized that yes, life is not a bed of roses but at the same time it is not as complex as we usually make it out to be. Throughout the book, Chas Watkins presented interesting conversations between Paul and the journalist, and Paul's bizarre take on life was unique, interesting and refreshing but above every this, I was particularly awed by his theories on how to empower yourself by taking control of your thoughts so you can achieve happiness.